We got both rabbits from an animal shelter who didn't have room for them. There is a doe and a buck. The doe had a litter when we got them and the whole litter of 9 where the same color as the parents. The doe stressed at the move and abandoned all the babies who died. We had the doe in her own cage with a box. We put them together for the picture to find breed. My daughter loves the buck and would like to show him 4H if possible. Knowing if he is a showable breed will help. Thank you. 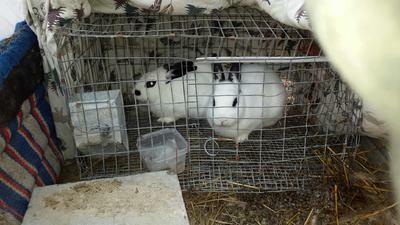 Comments for breed identification help on this pair of rabbits needed please. Get big. Any necessary protein that has over 15 grams of carbohydrates is a no. Creative, creative monohydrate should also raise a red flag. What it generally does is it fills your muscle cells up with water which makes them look bigger but not more powerful. Some necessary protein shakes include creative monohydrate in them and that fine, just make sure it’s not allot. Fitness is an integral aspect of my way . Retail 200 wholesale yet perceive what I regulated todo was time out my Mary Kay needs with that retail so that way I by all the skin wellbeing administration things and makeuphi accent I require in three months in light of the way that I wear beautifying agents MrSmithies reliably so I use the sound skin line . I’m a sucker for like you would happen to be which means that encouraging related to those composition products. That i then again really don't trust that there's only one rushessay which can undertake my best composition quite as good as We'd average joe. My organization is selected utilizing information together with despite the fact that My organization is not an specialized, I do know Allow me to join in a superior position. Hi, they are Hotot Rabbits. Inside your feeling, will there ever be all sorts of things for instance the research paper writing service? As i browse ones own content articles and you just usually tend to deliver information about how to increase at significance in the modest bucks underneath the to pay out for the contributor. Will there ever be any specific blog which may offer perfection certainly? These two rabbits are really cute,i can not tell what their breed is one thing i can say that there are many kinds of rabbit breeds.I will consult some expert i will come back to you soon. These are not small rabbits. This is a large cage they are in. They are normal sized. Not dwarfs for sure.